Buttons BeCause: HAPPY NEW BEAR! New bear Rocco and me wish you all a Happy New Bear! We spent the evening visting our friends in Woodstock. This year there was a Christmas present for me under their tree. 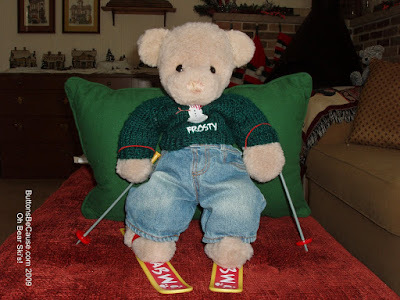 I got a ski jumper outfit and skis! I couldn't wait to try the skis out. Mom says I need some ski boots now. I asked my dad if he would help build me a ski jump. Hopfully Mom will get me the boots soon, so I can try them in the real snow. Speaking of snow, I have been checking on my snowbear everyday. This is what he looked like today. He took a tumble overnight, maybe he partied too hearty. I think I'm ready for my first nap of the new year I didn't get to bed till about 2:30 a.m. my self. Your snow bear looks bushed. 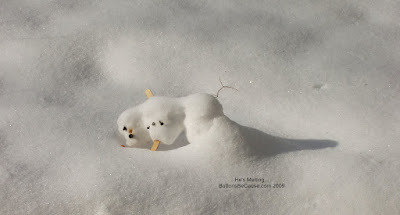 Did he party with the other snow bears to much. Happy new year! I bet that is what happened to your snowbear. He partied too hard and just fell over! Your skis are pretty neat! I hope your mom lets you go outside and ski with them soon! Happy New Year Buttons, and your Hug & Family! Sorry I have not been over for a while but Mother has had a differcult Holiday time cumulating in a mis-adventure on Boxing Day that left her in hospital for three days and me keeping the Hug together in the hope we were not abandoned. I envy your snow, we only have Mr Jack Frost in residence - brrr! And, your Ski outfit is impressive. I fear my stuffing is too old for such adventures, but mmaybe the younger bears might like to join you. I'm catching up with your blog and just saw your New Year's post. So sorry about your snowbear.